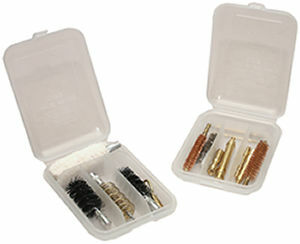 New for 2003 MTM Case-Gard�s Jag and Brush Case helps keep gun cleaning quick and organized, holding cleaning rod tips together in one, see-thru, palm sized container. Divided into four compartments, the JAG allows you to section brushes and jags by caliber, offering excellent storage efficiency. With a Jag and Brush Case, digging for brushes will no longer be an issue, you�ll see exactly where your cleaning tips are, every time you need them.